installation directory: "C:\Program Files (x86)\MiKTeX 2.9"
Next, I’ll install the Windows HTML Help Workshop. When you downloaded the file It may have already launched an installer. If not, then install it at this time. The install prompts you to create a HTML Help Workshop folder if you don’t have one. In addition, on my computer the install informs me that I have a newer version on my computer. Proceeding with the install, we note where the files are located C:\Program Files (x86)\HTML Help Workshop. We will need this for updating our PATH as well. 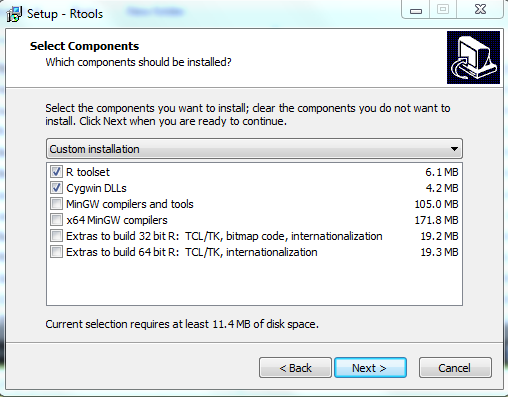 Rtools\MinGW directory are from the MinGW distribution. tools are all available online (at no charge) as described below. (LaTeX and the HTML Help Workshop). TO BUILD R, you need these plus item 3 below (Inno Setup). LaTeX is used to build .pdf forms of documentation. to build the R installer. Vanilla Perl is from build 7 of that package. tar is a locally modified version of tar version 1.21.
the other entries listed above) and use the DLLs from there. That’s not entirely clear, especially the bits about Cygwin. Do I need Cygwin to create a package that has no other code than R source. As the instructions are written they say that some of the tools require Cygwin. Are these tools I need? Do the compilers require Cygwin? Since I’m not sure, I’ll install it anyway. But first I noted that I had no existing installation of of Cygwin. 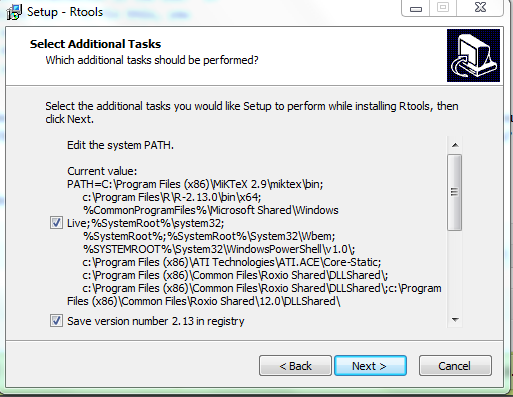 Note the install screens below and the options that I select. Please Note that in the Path I have a path to the R binaries. This is a critical item. Otherwise your R command will not work from the console. 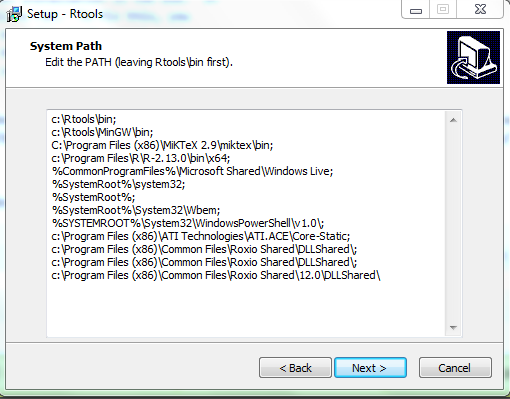 If your Path doesnt contain a statement like ..R 2.13\bin\x64.. then you will need to add that to your path. see step 6. This is VITAL. of course like your web site but you need to check the spelling on quite a few of your posts. Many of them are rife with spelling problems and I find it very bothersome to tell the truth nevertheless I’ll surely come back again.